Our cherished lake home is located on a point on Chief Lake, former residence of the World Record Musky (now residing on a wall at the Moccasin Bar 17 miles away in Hayward, Wisconsin). The home has a beautiful wood floor in the main living area and cedar paneling throughout. It has three bedrooms for moms and dads and a large cedar paneled "bunk room" with four single beds and room to play on the far end. Kids can play loud without disturbing their parents on the other end. All appliance are like new and a 50 inch smart TV with Direct TV service provides entertainment along with my old stereo from college that will plug into an iPhone. Kids and dogs play in a 1 3/4 acre wooded yard. A 30 foot sand beach and two docks make for great swimming and lounging in the sunshine. Also, there's plenty of room for hitching boats large and small. The Flowage is among the more famous fisheries in this part of the country. The annual Musky Hunt tournament takes place September 7- 9, 2017. Walleye, crappies, large and smallmouth bass and northern pike are also favorites throughout the Flowage. Many particularly serious fisherman come from far and wide to ply their skills. Dining is available by boat at two nearby locations and more places throughout the 17,000 acre Chippewa Flowage. Touring the 300 miles of shoreline and nine lakes that form the Flowage includes a walk beneath a blue-heron rookery; a walk on one of several floating islands populated with tall trees; having a picnic on a sandy beach on one of the dozens of islands; visiting the dam that forms the Flowage and many other interesting sights. Campsites are available first-come-first-serve on islands throughout the Flowage. Best of all, 95% of the Flowage remains in its natural state, undeveloped. Bald eagles, beavers, bears, otters and even an occasional wolf are often seen. The World Lumberjack Championship happens in Hayward each year (July 20-22, 2017) and the Lumberjack Bowl puts on performances all summer long. Just down the road fram Hayward is the famous Cranberry Festival in Stone Lake (Oct. 5-20, 2017). And Hayward is also the site of one of the world's great cross-country ski races, the Birkebeiner, next coming up Jan. 14, 2018. The 4th of July is an American classic that includes baseball, picnics, amusement rides and ends in a dazzling fireworks display. But most special of all for Hayward is its very own annual Musky Fest (June 23-25, 2017) when main street overflows with fun activities. There is no end to all the things for families to do in the Hayward area. I am a semi-retired entrepreneur and lawyer. My passion, however, is running a foundation I established in 1997. Using a franchise model we provide nearly 500,000 low income people in Kenyans with healthcare each year. (See more at www.healthstore.org.) I rent this property to help supply personal income as I do this work as a volunteer. We bought this property because its on a point with 500 feet of lakeshore on a 17,000 acre lake with endless things to see, do and explore. Best of all, the lake is not developed. 95% of the shoreline is as God made it. The three bedrooms and the bunkroom make room for ten in beds and the kids can make noise in the bunkroom (formerly a garage) without disturbing the adults reading, watching TV or just having conversation. Our lot is 1 3/4 acres on a point in this 17,000 acre lake, rich in wildlife. The Chippewa Flowage is a one-of-a-kind lake. Almost all the shoreline remains in its natural state. Many island afford exotic opportunities; like visiting a Blue Heron rookery and a massive floating island complete with a forrest of tall trees. The "Big Chip" is world famous for fishing having yielded the world record musky. And there are only a few places on its many miles of shoreline with a lot like ours. Hardwire phone is available but not connected. Can be connected. Sheets and pillowcases provided. Towels are not provided. Guests should bring their own. Living room fireplace and also a fire ring down by the point. Firewood is provided. Beautiful wood floor; tables and floor lamps; large leather sofa; 2 large Lazy-Boy recliners; fireplace, outdoor life pictures. Spices and other items left by the owners and previous quests. New appliances and new beautiful slate style tiling. Cafe style table and chairs. Takes CDs and plugs into mobile devices through ear phone jack. Small collection of good books. Some toys for small children in bunkhouse; a few beach toys and wind surging board in the storage shed. Large wooded lot and plenty of room for kids to play. Lot's of sunshine and shade. 2 canoes, on large and one small, plus a 14 foot aluminum boat (no oars or motor) available for guest use. GUESTS USE THESE AT THEIR OWN RISK. Deck by lakeside with two Adirondack Chairs. Plenty of room to add more seating. Great place to take in the lake view, read books, and the like. Also, a swing chair for two at lakeside. Beauty all around, cant wait to come back in spring! This property has it all...deck by the water, 3 season porch, fire ring, 2 docks, sandy beach, boat launch on the property (depending on water level), full kitchen equipped with all appliances and everything you would have at home. Sunsets were beautiful! Town was close by so we could easily pick up some groceries and visit local shops and attractions. For late summer/early fall (Labor Day Week) the fishing was very good. The owner was at the house when we arrived so had an opportunity to visit with him for a bit....very cordial and hospitable and intent to ensure all our needs were met and we had a memorable experience. Mission accomplished!! 2 days into our stay my spouse and adult son and daughter were already making plans to stay again. acte Chippewa Flowage. Former home of the world record Musky! A top fishing destination in the Midwest. Great spot on a beautiful lake! This is a great property! We had our daughter, son-in-law, grand kids and a few friends along on vacation and found this to be a wonderful spot. The beach area was not huge but sandy and very nice for swimming. The swing is great for looking out at the lake and enjoying and early morning coffee. We found lots of fish and had a couple of wonderful fish fries. Scott did everything he could to make our stay perfect. The layout was great for our mix of adults and children and the kitchen was awesome for whipping up meals for a large group. The nicely maintained docks had plenty of space for our two fishing boats and a pontoon we rented for a day. Nice touches for us were the screened in porch, fish cleaning table, fire pit with plenty of seating to watch the Perseid meteor shower, power at the dock and a long hose to clean out the boats or rinse off the dogs. Great private location at the end of the road. Like any cabin in the woods there are some minor things that need addressing but all in all a great place to visit. Thanks, Joanne for sharing your experience. We work hard to make a stay at our place a great experience for sour geuests. It’s especially gratifying to hear that families had a wonderful time as yours did! We’re hearing a lot of reports that fishing has been good this summer. This reflects the good job being done by fish and game management. All part of the good things happening in Sawyer County, Wisconsin. We all enjoyed this wonderful property! We did rent a pontoon and our son brought his boat which kept everyone busy as we explored, fished and played on the many lakes around this cabin/house. There was plenty of room for all ten of us! Indeed, the Chippewa Foliage--a 17,000 acre impoundment joining nine lakes into one--with many islands throughout is a treasure. 90%+ of its 200+ miles of shoreline is preserved in its natural condition. Huge floating islands, a herron rookery, hiking trails and a variety of fishing opportunities make make it like none other. We love to see families have great experiences. We loved our stay at this cabin! The lake views are amazing and the dock is very stable to walk on. Some of the best fishing on the Chip right outside the door. Everyone in our group was happy with their room and we look forward to staying here again. 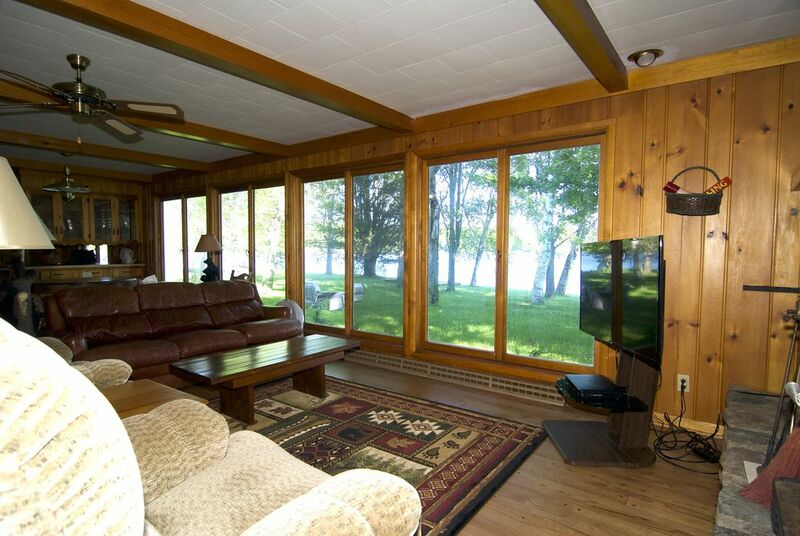 Awesome views of the lake, with level grounds to the beach /docks area. I would recommend this location to anyone. We simply had a wonderful time. Lake home is located on a point in Chief Lake of the Chippewa Flowage near Haryward, Wisconsin. It's the very last place at the end of Buckhorn Rd. In the near the tiny town of Couderey.